Where: On any road before a intersection with traffic light. 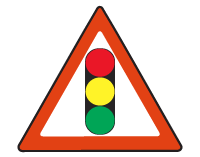 Purpose: To warn that there are isolated and particularly new traffic lights or traffic lights near an isolated traffic light at a pedestrian crossing ahead. Action: Slow down immediately and be ready to stop if the light changes from green to amber. Make sure there are no pedestrians or cross-traffic who might not obey the signals.